These words kept racing through the boy’s head until he finally felt secure in them and garnered up the courage to speak them aloud. “I’ve never seen so many fish!” the boy shouted to his father. His father laughed quietly to himself. The heavy, fish-filled net slipped quickly through their fingers as they pulled it in. The boy’s heavy eyes were now rich with excitement, beaming through their tired sockets worn out from excessive staring. All he could see was an intense mixture of blue and green. It had happened as quickly as a fresh thought to the boy’s daydreaming mind. The dark, wavy spots of blue-green in his eyes had suddenly taken on a new form when the fish started coming in. His father had been yelling something the boy didn’t now recall, for his eyes and ears had not been open until that moment. The air surged with furious racket from the flapping of fish as their tails slapped the water on their way up and the boat on their way in. 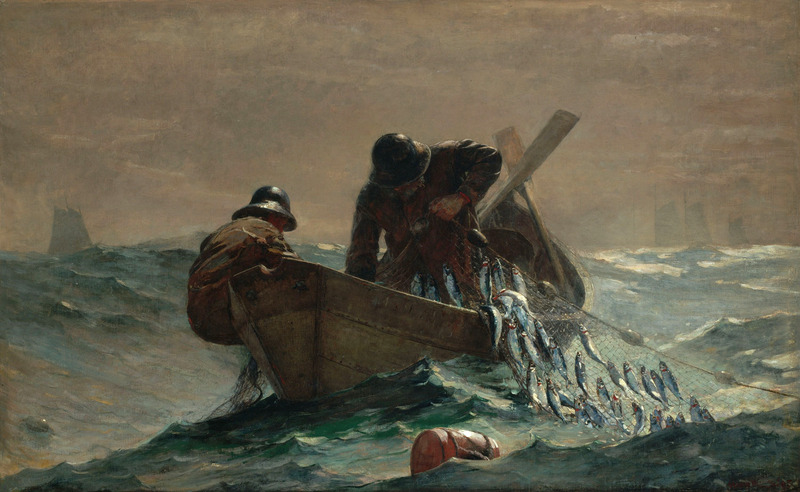 The boy kept rubbing his fingers on his coat as the oily fish loosened his grip on the net. The boat was rocking rapidly in every direction as he dropped the fish in at every corner, being certain not to slow his father up. The tossing of the waves shuffled his balance. Every so often, he would look up at his father with a wild grin to show off his pleasure, but also in hopes that he might gain a reaction or see what his father thought. His father was a chiseled, stone figure. Every motion was calculated and perfectly executed. The boy watched in wonder as his father worked in such a way that he was unsure he would ever be able to. “How did he get so good?” the boy thought. His father muscled in miles of fish with every stroke, and the boy’s pile of work grew rapidly by the moment as he fell further and further behind. Every few moments, the boy paused and looked at his task in disbelief, only to continue and repeat the process. “I don’t know if we can handle all these fish,” said the boy’s father as he continued to pull them in with no signs of slowing down. The boy jerked his head up at his father. That thought had never crossed his mind. Even though it was a ridiculous amount of work, he knew his father would eventually start to help him, and that thought spurred him on to continue. How could they give up such a catch for only a portion? He tested the weight of these thoughts, being careful not to spout out something dumb and unintelligent. The pile of fish grew and overlapped, forming stacks of fish, all of which needed to be dumped out of the net. He had grown weak after what his father had said, which put him even further behind. The boy shuddered and jolted back to work as the harsh, feared words of discipline hit him like a blow straight to the gut. The boy and his father kept working for a great deal of time, and eventually his father pulled in the last of the net and joined in with him. The boy worked faster and minded his movements much more meticulously as he watched his father work in the corner of his eye. Their rate of work jumped exponentially, as his father moved his hands like a machine. After all the fish had been freed from the net, the boy and his father stopped for a moment to rest, much to the pleasure of the boy as he lounged back on the edge of the boat and marveled at the work they had done. His father sat hunched over, and he looked all around the boat, every now and then finding something to do instead of resting. The boy repositioned himself, hoping not to appear so lazy and carefree. With a sudden burst of courage, he spoke up, addressing his ever present curiosity. “Were you serious,” the boy asked, “when you said you didn’t think we could take them all? His father looked up at him for a brief moment, then looked back down at his feet and smiled faintly. “I didn’t know how many we had,” said his father. His father smiled a bit more, finally taking a moment to rest. “I dunno,” said the boy. The boy shrugged his shoulders and fought back a grin. The boy’s eyes lit up as he jerked his head up toward his father. The boy pondered for a moment. “How much money do you think it would be?” asked the boy, searching for the answer to grace his father’s lips. His father never answered anything fast enough for his liking. “Well, yeah,” said his father. “Then what?” rushed the boy. “Well then we wouldn’t have to work for a while.” said his father. “Man,” said the boy as his mind raced like a ball packed with a jet engine bouncing in a box. “What’s so bad about that?” His thoughts were now slipping out into words quicker than he could test them. “Eventually we’d probably spend it all,” said his father. “How?” asked his son in disbelief. The boy wrestled with that statement for a while. “Yeah, I guess,” said the boy. “What if all the sharks disappeared?” asked the boy. The boy sat and looked at all the fish. Every herring in the ocean was a wild thought, but even still, the mass in front of him truly held more herring than he had ever seen in his life. The thought of bringing in any more made his body feel weak. Then, just as quickly as the fish had come in, his dad interrupted the stillness. As the boy and his father prepared to row in, he looked out at the water, still brimming with thick, heavy waves. He knew that all the herring in their boat couldn’t even come close to the amount still in the water, and he smiled as he thought of all the catches they had yet to bring in.